Phil Jones gets his share of criticism but the Manchester United defender copes well enough to enjoy himself. 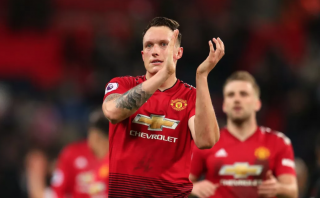 Any conversation referencing Jones on social media tends to be fully loaded with memes, funny faces, own goals and injuries, but he gets on with it and is happy about how his career has planned out thus far. He has currently been out of the team due to illness, but could return as early as today in the FA Cup quarter-final against Wolves. However, there is enough evidence to suggest Ole Gunnar Solskjaer’s preferred centre-back pairing involves Victor Lindelof and Chris Smalling. Jones is not oblivious to the stick he gets on social media and puts his ability to cope with it all down to being strong mentally. “I’m lucky enough that I am strong mentally,” the England international added. “I know a lot of players will come out and say in the press that it doesn’t bother them and then two minutes later they’ll be on the Daily Mail on their phones, but it genuinely doesn’t bother me. Jones is right to come out and defend himself, but the best way to do that is on the pitch. He could become an important backup option at United, if he’s happy to play such a role in the squad but if we’re aiming for league titles we need better centre-backs than Jones.